February 28, 2013 Posted in Travel Posts. Most of my time here in Colorado has been spent in Denver which greeted me with bright blue skies and clear fresh weather, apparently Denver experiences 300 days of sunshine a year so sun screen is a must, of course due to the high altitude of the town snow is very likely too, both of which have happened. 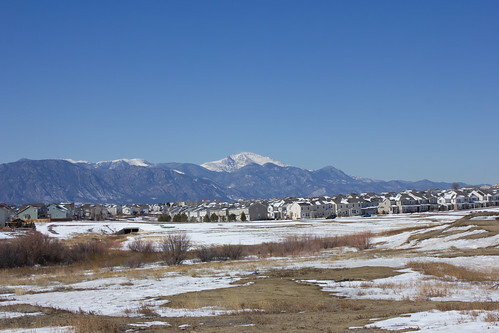 During my time here I have managed to travel to Boulder and walk up a bit of a hill to take in the scenery. This is why I headed to the mountains in the first place and it was here I managed to snap a photo of myself that could double as a catalogue model, not bad considering I didn’t have my tripod with me. Again I’m not sure if it’s a Denver thing but I had had to get used to walking past people on the street and them saying hello to me. Maybe it’s just me but London has taught me that whenever people come up to me in the street they usually want something so it has taken me a while to drop some of the guard that I have. Denver is a great city, lots to do and well connected by busses, it even has a tram system too which cruises through the main part of downtown. This might be a case of too much information but these are the things that trouble you when your travelling, I found a hole in my trousers where a hole really should not be. After trekking down to the local mall and going into several shops asking for “Cargo pants” (translated as combat style trousers) finding a fashionable pair in gap that had a tapered leg (yuck) I finally found a pair but ended up paying $60 for them.. ouch! I also bought tickets to see the Colorado Rockies play to find out that the spring training game takes place in Arizona. So a refund was issued and I may of lost a few dollars for fees etc but at least I have the majority back. Colorado has as well as mountains has a huge beer culture. You may know how craft breweries in the UK are beginning to pop up, well imagine if this has been happening for a while and the UK had twice as many. Denver has two bars (that I have been to) that provide an overwhelming choice of ale. First up is the Falling Rock Tap House who have a stupid 80+ beers on tap including belgian, from all around the US and of course Colorado. Secondly is the more upmarket feeling Yard House, again they have a dizzying amount of choice here and this menu should give you an idea of what is on. It makes me wonder when the beer festival happens how many beers are we talking about and if they see any UK based stuff sneaking in. I went to this thing called Artopia which was a fairly cool collection of art, music, comedy and performance. Everything from Burlesque to a DJ twiddling knobs attached to a Mac and 5 people dancing around them like fools. I generally quite liked the art, one artist in particular was called Barry “Wildman” Snyder who makes all of his work from the stickers that you peel off fruit I also really like the style of Jamie Molina. Bands of note were Fierce Bad Rabbit, In The Whale, and the rather humorous Kitty Crimes. So I only have a few days left in Colorado and so I have made my way despite the 5-6 inches of snow into Colorado Springs. 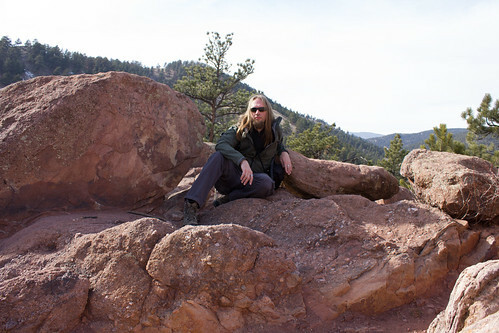 I found a place to stay outside of town and the guy who owns the house is really nice, picked me up from downtown to get to his place and is offering to drive me to some place called the Garden Of The Gods which in the snow I am sure will look fantastic. Jealous yet? No? What if I told you that I can walk down the road and see this for a view? Still no? Okay add to that he has two beautiful dogs, one of which is very hard to photograph due to the fact that it does not stop moving. Don’t expect an entry for a few days, tweets will also fade away a little as when I get back to Denver I should be on a train to Sacramento and then to Merced without any internets. No doubt during the 34 hour train journey I will find time to write something so expect it then, expect more from Colorado as I have had a great few days and have started to piece together several other bits, no idea when they will get posted though.